News articles are written by journalists. They often include quotes and statements, but all this information is usually edited to fit together in one cohesive article. Comments are unedited and complete, and come directly from the individuals they’re attributed to. These individuals are participants in stories or members of organizations mentioned in stories. Comments will allow Google News users to find out the story behind a story and to know exactly what the people in the news think about the news. 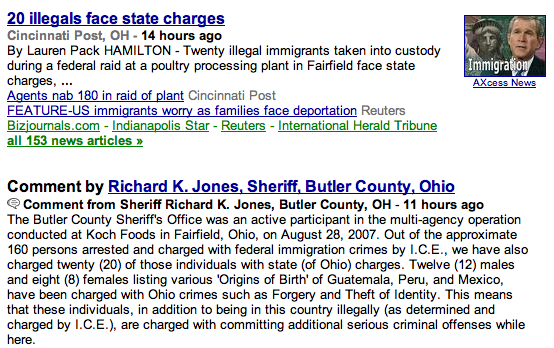 Compare this with today’s Forum discussion (look for “Illegal Worker Crackdown” on this page). I am sure Google has good intentions here but they are trivializing a very very complex issue and randomly offering voice to whoever approaches them. As a big and responsible organization they need to publish guidelines for accepting comments and not just be random, like the way they are in approving adsense account. Stakes are higher here. News trustworthiness is a key driver for ensuring fair functioning of democratic processes. Google is tampering with it without properly disclosing the formula. Comments are opinions and opinions make editorials. Does this mean Google is now getting into editorial business? Because of Google’s campaign to simultaneously reduce duplicate articles, the original wire service article is likely to be featured in Google News instead of versions of the same article from newspaper customers, sapping ad revenue to those newspapers. Google’s attempt to reduce duplicate article reads like an extention of their core search quality initiative. If implemented correctly, this will result in more casualty for the mainstream media. I doubt if on this particular issue, readers are going to shed any tears.